‘Moon Princess’ Celeste (Special Edition) is Coming Soon! ‘Apprentice’ Samuel is Coming Soon! 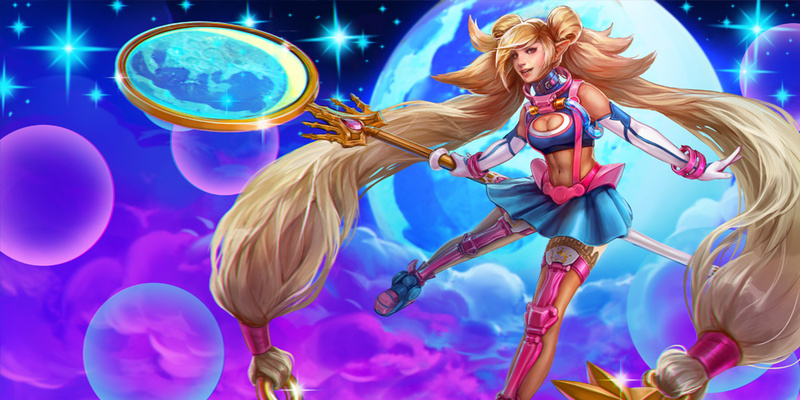 Coming in Update 1.22, special-edition ‘Moon Princess’ Celeste has saved the moon bunny! This Autumn seasonal skin comes with a brand-new look and an entire new suite of effects. ‘Moon Princess’ Celeste will be available for direct ICE purchase during Update 1.22. Act fast: This skin is 25% off during the first 10 days of the update! Helio Supernova: Stars fly out! Celeste was walking home after studying late at the Taizen High School library one night when she heard a snivel-y weepy sound coming from the park. She followed the bawling to the swing set, where she found a brown-spotted bunny. The bunny was swinging super high, so high that Celeste was afraid he would go all the way around, then he jumped out of the seat with his four legs and floppy ears spread wide only to faceplant in the grass. With slumped shoulders and hiccup-y sobs he climbed back up into the swing and began again. “I fell off the moo-oo-oon,” wailed the bunny, swinging higher and higher. “All mooncakes are made by bunnies on the moon,” wept the bunny. “Then I need to get you back up to the moon,” said Celeste. She picked up the bunny and craned her neck to look up, squinted one eye shut to gauge the distance. Sometimes stars came down from the sky to play with her; it made sense that she could go up to play with the moon. It wasn’t so far away as a star, after all. So she stared up at the moon and spun in a circle, spun and spun, faster and faster, her long braids whipping into a whirlwind, and soon her feet weren’t on the ground anymore, and then if she’d looked down she’d have seen the swing set far below, and the tops of roofs, and then Taizen Gate turned into a sprinkling of pretty lights in the distance past the clouds, and then it became very quiet, and then they were on the moon. They landed at the edge of the sparkling moondust falls where the bunny had tumbled off and were surrounded all at once by rabbits of all colors, even some striped like peppermint sticks, others polka-dotted like party dresses. The spotted bunny leaped from Celeste’s arms into his mother’s paws and the rest led Celeste off to the mooncake village, where all of the buildings were made of different flavors of mooncakes. The bunnies gave her super-tech moonwalking boots and a magical moon staff and made her the princess of the moon. Her most important princess duty was to taste all of the mooncake flavors, and she took to the task with great seriousness. After a whole night of mooncake eating, she told the rabbits that she had to return home. The rabbits were sad and tried to make her stay. Celeste explained that her brother Vox would get into trouble without her there to care for him, but to show her dedication to her duties, she returned every week thereafter to be Moon Princess, and to teach the rabbits a little magic, and for the official mooncake taste-testing (even though peanut butter was always her favorite).